There's nothing worse than getting an unexpected bill, and then trying to figure how to make 100 dollars fast enough to cover an expense you hadn't budgeted for. You need a solution…but you can’t even think straight right now. That’s why we put together this guide explaining ways you can make 100 dollars fast. In fact, it’s quite possible for you to make 100 dollars a day with some of the ideas listed here. Some of the tips we give you here can have the immediate result you're looking for, while others can be combined to put at least $100 in your pocket within the next week or two. The most important piece of advice we can give you is to focus on providing a service of some kind. Forget about coming up with a business plan that will change the world – you need to focus on proven ways to earn money. If your service proves popular, you can easily expand it into full-time business if you want. When people start looking for an external solution to their current financial woes they often miss the obvious. You'd be amazed at how much money you unnecessarily burn through each week just on food items alone. The worst part is that it's usually on food items you don't actually need. Or on food items that are just filled with empty calories. That $5 coffee on your way to work each day, and maybe another one after lunch? Ditch them. The pizza and takeaway during the week because you're too tired (lazy…you're too lazy) to cook? That's another $40 down the toilet. You smoke too? Quit for a week, and that's another $42 in your pocket. You could be really creative here and set yourself the challenge of living on $25 of groceries this week. This will include bringing your own food to work each day. Eliminating expensive coffee, $10 lunches, smoking and anything else you're wasting money on, can easily put an extra $100 in your pocket this week. A quick fix for not having any money is to temporarily do without some of your entertainment frills. These include your cable TV connection, your expensive smartphone plan, and your Netflix subscription. In fact, many households have subscriptions for different digital services that are rarely used. Some of them only cost a few dollars per month, but it all adds up. 46% of Americans spend at least $71 on their cell phone bill each month, and another $64 on their cable TV package. Eliminating your cable TV package and choosing a cheaper cell phone package for the next month can quite easily put $100 back in your pocket. Yes, you'll be bored without as much access to digital content as before. But that's a perfect excuse for catching up on all those books you've been meaning to read. A great book to start with is The Total Money Makeover by Dave Ramsey. You don't own it? Get it from the local library. You can automate the process of tracking down all of those unused/expensive subscriptions using a service call Trim. Most people are are horrified when they realize how many subscriptions they actually have. Let's face facts: You probably hate your job. But love it or hate it, it's your only form of income right now. Companies are usually happy enough to have employees work some overtime, mainly because they’ll have at least a few people out sick, or just not able to make their shift that day. You might not relish the idea of working those extra hours, but if you're strategic about it you can earn more money in less time. You do this by signing up for weekend shifts, or late shifts. Because these usually have a “shift premium” of anything up to 25% attached to them. So, instead of earning $10 per hour you'd be earning $12.50 per hour. You'd only have to work 10 hours overtime instead of 12 hours overtime to hit your money goal. We're making allowances for taxes, by the way. It's not just lousy math. Some companies pay way more than a 25% shift premium, requiring you to work fewer hours for the same financial result. Sometimes the easiest way to figure out how to make 100 dollars fast is to simply ask your employer. We know you already work hard enough, but if you're facing a personal financial crisis then you don't have time to feel bad – you only have time to get out there and earn. What you're looking for is the type of part-time work done by college students e.g. bartending, or waiting tables. The reason why is that people working these jobs can make as much in tips as they do from their basic salary. The tip money is divided up at the end of each shift, or sometimes at the end of the week. Tips can make working in a bar or restaurant more than worth your while, as long as you choose the right place to work. And here are some great tips for making the most of your part-time bartending job, if that's the route you choose to follow. We deliberately put this option here because we know you're probably going “…why didn't I think of that?” The key here is not just to march into your boss’s office and demand a raise. Instead come up with a proposal that explains exactly what you'll do to justify the extra money you’re asking for. So, let's say you're working in retail. Getting a raise here might be as simple as suggesting a new process for reducing loss prevention (shoplifting) based on the most frequently stolen items. Look for something you can do that will directly benefit your employer financially, but costs them very little money in return. This method of making $100 requires a little bit of your time, some research, and a tiny investment. Basically you visit charity or thrift stores in your area, and check out three types of items: books, women's dresses, and tea/coffee cups. Well, because books, dresses and tea cups all have an identifying mark, of one kind or another, that allows you to quickly identify their value. And you'll be amazed at the incredibly valuable items you can find lying on the dusty shelves of your average thrift store. It's entirely possible to buy used vintage or designer clothing in a thrift store and flip them on Craigslist for a tidy profit. Are you the computer hobbyist friend everyone turns to when they have some kind of glitch with their computer? But you're too nice to ask for money when you fix it, so they give you pie or beer instead? Did you know most computer stores charge $65 just to remove a virus or malware! We don't care how nice your friend's pie is, it's definitely not worth $65. You can create a Facebook page for your computer repair “business” in 10 minutes, and then just ask your previous customers for referrals. It takes no more than an hour to completely remove a virus or malware from a computer, and you only need to do that for two customers to cover your cash crisis. Have you ever been complimented on the quality of your resumé and cover letter? Awesome, because most people are absolutely awful at both writing application letters and formatting their resume in a way that won't make recruiters choke on their coffee. You can easily charge $50 to prepare somebody's resumé for them, and another $40 to write their cover letter. Resumé writing services often charge at least twice that amount, so you're offering your customers a bargain. Relax, we don't literally mean your bodily fluids. What we do mean is that your neighborhood no doubt has dozens of people who need your help. They need snow shoveled, lawns mowed, leaves collected, their windows cleaned, furniture moved, their home or apartment cleaned, or their car washed. You can print out some flyers using your home computer, and then just distribute them to friendly store windows and noticeboards in the area. How much can you charge? Shoveling snow can net you $20 for just clearing the front of a house. You can charge $30 for mowing lawn, so you only need to mow a handful to earn the money you need. If you need some inspiration read how Stephanie Nesseth turned her need to provide for her family into a thriving cleaning business. Unless you've been living in a cave for the last decade or so, then you'll have heard about Airbnb. It's a really simple concept: you rent out your spare room for cash to short-term guests. In fact, you can even go as far as renting out your entire home for other people to live in. How much you can rent your room/house for will depend on where you live.Centrally-located homes or apartments fetch higher prices than if you're living in the sticks. As a general rule, there's no reason why you can't lease your spare bedroom to Airbnb customers for $30 per night. Or you could stay with friends for a week or two, while renting out your home or apartment, and net several hundred dollars. Evan Kimbrell is a perfect example of what’s possible with Airbnb. You might want to sit down before you read his story. One of the biggest headaches you run into when moving to a new home is finding somewhere to store all your stuff. Sure, there are dedicated storage units you can lease for a few weeks, or months, but they can be prohibitively expensive. Your unused garage or attic space is in demand from people who need short-term storage, but without a serious case of sticker shock. How cool would it be to get paid for simply stacking some boxes in the attic you never use for anything else? A 1-car garage can rent for about $125 per month, so you can expect to charge roughly the same for your attic space, or a spare bedroom. You've probably heard lots of stories about people making money by working with Uber or Lyft, but have you ever thought about doing it yourself? Sure, ferrying people around is going to eat into your free time, but it will only take a handful of driving gigs for you to earn that money you so badly need. Or, you could be really strategic here, and just look for driving gigs that work around your lifestyle. For example, you could drive a passenger to the same place you plan on doing your grocery shopping this week. A little bit of lateral thinking can go a long way in making driving gigs work for you, instead of the other way around. Figuring out how to make 100 dollars fast by just driving people around isn't exactly rocket science, is it? Delivering takeaway food or groceries might not be the most glamorous job in the whole world. but these jobs pay regular money. There's the added bonus that at least one fast food joint in your town will be looking for new drivers. The reason why is that the staff turnover rates in delivery jobs can be very high. But the upside here for you is that there will always be lots of work available.Remember this isn't a new career for you – it's just a temporary gig until you get your finances sorted out. There's the added bonuses that you don't have to ferry passengers around, and you can also make extra money from tips. We can pretty much guarantee that you have $100 of unused items in your home. They might not be obvious at first, but the trick is to look for something you haven't used at all in the last 6 months – electronics, clothing, or whatever. The 6 month mark is important because if you haven't used the item within that time frame, then there's a very strong chance you'll never use it again. So why not sell it for cash instead on Craigslist or eBay? Just do your due diligence before you list your items. You have to research what other people are selling them for, and then list your items for 10% less than that. You don't have anything lying around that hasn't been used in the last few months? Well, then – and this might hurt – maybe it's time for your games console to go to a new home. Did you know that many of the first generation smartphones used gold components in their construction? Now, don't expect to crack your smart phone open and find a gold nugget in there. But the fact remains there's a ready market for older smartphones because they contain a variety of precious metals, albeit in small quantities. Check with family and friends if they have old phones they're no longer using, and then either sell them to a smartphone recycling company, where you can get paid cash money for them. Or you can sell the phone to a scrap metal dealer, but with the knowledge that there's a small quantity of gold inside the device i.e. ask for more money for it. You don't believe that old phones are scrapped for the precious metals inside them? If you don't have the time to organize selling your stuff online via Craigslist or eBay, then just gather together your unused items and hold a yard or garage sale. Yes, this might mean swallowing your pride a little bit, but just take a humorous approach to it – your attitude will always dictate your altitude, as a clever man once said. Most towns have their own flea markets and swap meets. Getting your own table there might cost a few dollars, but with careful production selection and a little bit of salesmanship, there's no reason why you can't cover your costs + $50 – $100 in a day or two of selling. Pawn shops are the last resort because they offer cents on the dollar for items. But if you're absolutely desperate for cash then you can pawn one of your more valuable possessions. Who doesn't want to play with doggies all day and get paid for it? If you read a job description that went something like this, “Person required to ruffle my dog's ears and rub her belly. $20 per hour”, wouldn't you sign up? We would! While humans are competing to keep their jobs, their canine companions are often left at home. Dogs hate being alone. They don't understand why the rest of their pack (you) isn't around them all day. So, there are a lot of fur baby parents who will quite happily pay you to visit with or walk their dog, either in their home or your own. You can charge $10 – $20 per day for dog-sitting, and up to $75 for an overnight stay. And the neat thing is that you don’t even need to go out there and market your service – just use a site like DogVacay or Rover instead. Relax, you don't need to be J.K Rowling to make money from writing. In fact, you only need the ability to research a topic, and then write it in a structured way. Your writing skills will improve the more you actually write, so don't sweat the finer details right now. The real beauty of freelance writing is that there is huge demand for it. Companies are looking for people just like you to write on topics ranging from college courses to cats. Your biggest hurdle when writing for the first time is finding clients, but you can shortcut that by using sites like OneSpace or iWriter. Now, these sites don't pay a fortune for written work, but they pay very quickly for the work you do. You might need to write 10 – 20 short articles or blog posts to make your $100, but they always, always have work available. iWriter offers weekly payments via PayPal, and OneSpace deposit money into your PayPal account once your content is accepted. You can also used sites like Upwork to find freelance writing job, but their payment process is a lot slower than either OneSpace or iWriter. Asking most people to create a functioning website is the equivalent of asking them to put together a mission to Mars. So, if you have even the most rudimentary knowledge of how to go about creating a website, this is a skill you can sell. You can start by looking up small businesses in your area on Facebook, look at their ‘About' section and see if they have a website. If not then you've just found your first potential customer. Professional web design companies can charge $10,000+ for a slick website, which is simply beyond the financial means of most small business owners. You, on the other hand, would be willing to create 3-page website for that small business for $100. You could ask for a lot more, but this price is so low most businesses will struggle to find a reason to say “No” to your offer. Not sure how you can sell the idea to them? That's the easy bit: Ask them what it would be worth to their business if you could get them 3 new customers per month, every month, all thanks to the website you'll build for them. How can you know in advance they'll get customers from the new website? The law of averages states they will. You have no doubt heard all about how much money those big social media influencers make. And you can't walk two blocks without bumping into somebody who claims to be a social media manager. The thing is most of them are just posturing – their idea of social media management is that they have 1,000 followers on their personal Instagram page. But small businesses in your home town need people just like you to help manage their social media presence. Most of them delegate the work to an employee, but if the employee leaves, or just forgets, then their social presence suffers. You, on the other hand, would be more than happy to manage their Facebook and Twitter account for the low, low price of just $100 per month. It will take about an hour of your time each week to do this for any small business. Leaving your home unattended for days or weeks at a time is an invitation to burglars. It doesn't matter how high-tech your security or alarm system is, they'll be in and gone before the police ever show up. As a house sitter you basically move in to another person's home and live there while they're away. Some people do this free of charge, asking for nothing more than light, heat and food in return. The average house sitter charges a minimum of $25 per day, and a maximum of $45. So you can make $100 by sleeping in another person's house over a weekend. Not sure where to even start? Check out MindAHome, or just Google “house sitting service in <your area>”- you'll find lots of companies looking for house sitters. Or just create your own house sitting service page on Facebook, and ask your friends to share it for you. Every bleary-eyed, anxious, exhausted parent in the world will need a babysitter at some stage. And they're more than happy to pay you $10 – $15 per hour to get a break away from their kids. Community or neighborhood groups on Facebook are a great way to advertise your service. You won't be waiting long to get your first customer if you combine a Facebook page with some word-of-mouth advertising. Want to set yourself apart from the competition? Offer to babysit when nobody else does or is willing to – early mornings, late evenings, weekends, or in the middle of the day. Become the person parents call when they have to run out for lunch with friends, but can't find a baby sitter at short notice. Once you become that person, you become indispensable. If you don't think babysitting is a real business, Lynn Perkins might just disagree with you. She's the CEO of a company called UrbanSitter, which grew from Lynn's need to find reliable babysitters for her twins. Her company recently raised US$23 million to further expand the services she offers her customers. While that might sound like an insult, there's nothing better than helping somebody learn a new skill. Don't worry if you're not an expert in something – you don't need to be. You just need to know a little more than the person hiring you to teach them. Can you sing, play a musical instrument, make your dog obey commands, write a wedding speech, sew, knit, bake, do basic car or motorcycle maintenance,or make crafty things? The fact you can speak, read and write in fluent English is also a skill you can sell. Every person reading this right now has a skill they can teach somebody. And those same people wanting to learn that skill will quite happily pay you for it. If you want to drum up lots of business quickly, then keep your fees at around $10 per hour. But if you feel you're worth more, then don't be afraid to charge $20 per hour. You know that delicious chocolate chip cookie you grab with your low-fat cappuccino every morning? You're happy to pay $3 for it because it's convenient and tastes delicious. Hey, who could blame you? What you probably didn't know is that cookie cost about 25c to bake – including ingredients. That’s $2.75c profit on every single cookie sold. Baking cookies is one of the easiest things in the world, so even if you don’t know how just find a recipe on YouTube and follow it. All you need is eggs, sugar, butter, flour and chocolate chips, which you probably already have at home. You can take those ingredients you already own and make at least 12 cookies from, with a retail value of $36. Baking and selling four batches of those cookies will net you $100, once you take away your expenses. A great place to start is at any swap meet or flea market where somebody else sells coffee. Or you could double up by including your cookies along with other items you're trying to sell for cash at the same venue. There's nothing worse than seeing people dump their trash in public, especially in parking lots. Not only does it set the wrong tone for the neighborhood, but it also sets the wrong tone for nearby businesses. Why not approach the property management company responsible for the car lot, and offer to pick up the trash other people leave behind? You can quite easily charge $20 per hour for this type of work, and you also help keep your city or town looking great. And all the tools required are some waste sacks, and a few hours of your time. Brian Winch of CleanLots is the perfect example of how clearing up other people's mess is a great way to earn quick cash, and lots of it. We're now delving into the territory of “I've tired everything else, but am out of ideas”. Selling your blood or plasma is a quick way to make extra cash, even though it’s not the most appealing way of doing that. You get paid more for plasma than whole blood, at a rate of between $25 – $50 for each time you donate. The only downside here is that your local blood bank will only accept donations from you twice each week, for health reasons. That means it will take two weeks to earn that extra 100 dollars you need. You can find your nearest blood donation center here. If you're a bit of a piston head, and can quote car values without going online, then flipping cars might be quite possibly the quickest way for you to make extra money. The process is the same as flipping houses i.e. you buy low and sell high, doing as little as possible to earn the maximum amount of money in return. Now, in our situation you don't have the cash to flip a car, but you probably own a car. If so you can sell your own car for say $500. Then take that money and find a car that you know for an absolute fact is worth at least $800, but is on sale for $500. Or find somebody who's absolutely desperate to sell their car and offer them well below market value. Once you flip this new car you'll have $800 profit sitting in your bank account. Do one more flip of a car bought for $800, and then sell it for $1000. You now have a couple hundred extra in your bank account, plus you can afford to buy a better car than you owned two weeks ago. Cool! The most expensive wigs are made from real human hair, and good quality human hair 10-inches or longer in length is always in demand. Well it's in demand as long as you don't dye, heat or treat your hair, and you also need to be a non-smoker. Not sure where to sell your hair? Well how about listing it in a “hair for sale” marketplace? How much can you earn? Anywhere up to several thousand dollars if you have long, healthy hair. At the bare minimum you can expect to be paid at least $100 for your lovely tresses. You're a bit freaked out about selling your hair to somebody else? Don't worry, it'll grow back. Nobody knows a city as well as the people living there i.e. you. So why not offer guided walking tours of your city to tourists who are eager know it as intimately as you do? Or maybe you could offer a photography tour, so your group of tourists can capture pictures of sights over groups will never see. Or if that doesn't quite appeal to you, then why not offer them a guided drinking or eating tour of your city. You can show them the best bars and nightclubs to hang out in, or the best restaurants to dine in. You could even double up your earnings here by working with local businesses to have them featured as part of your tour. The fees you can charge will depend on where you live. A 4-hour guided tour of Paris for three people ca cost $250, but your guided tour of the best bars in Boise probably won't fetch as high a price. You can offer your local expertise via websites like Vayable. We love this one because it's so easy that anyone can do it. There's also a lot of income potential for people willing to really work at it. You find something on sale in a local store costing $5 each. You check on Amazon and find other people selling the same item for $12 each. There are various apps to help you speed up the price comparison process – Profit Bandit is a popular one. With Amazon Arbitrage you would then buy several of these items at $5 each, and then ship them to an Amazon fulfillment center via your free Amazon Seller account. You then list your products on Amazon, maybe dropping your price to $10 for the item you're selling. That's still two bucks less than your competition, but you stand to make almost 100% profit. Your products are now listed on the world's biggest online retail platform. As they sell Amazon will deposit funds into your account, and then automatically deposit those funds into your bank account every 14 days. You can bank some easy cash by signing up for a service like Task Rabbit. It's a simple idea: You spend time doing other people's chores – the same odd jobs they simply don't have time for. There are thousands of people willing to pay you to collect their dry cleaning, rake their lawn, clean their home, assemble their flat-pack furniture, do their laundry, or any of dozens of other tasks they can't do themselves. How much can you earn? It's all based on hourly rates, but here's a Task Rabbit success story that might just blow your mind. You get paid for completing your task pretty much straight away, but it can take a few days for your cash to hit your bank account. You can help people with their lives, while also making thousands of dollars each month. Cool, right? 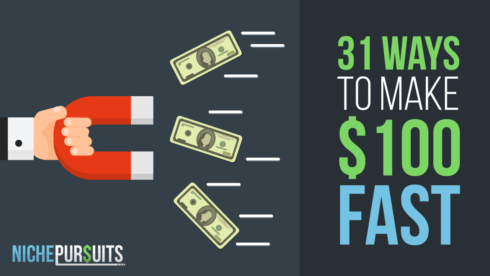 So, there you have it – 31 rock solid ideas for generating money, and sometimes with almost no effort on your part. We deliberately omitted topics like blogging or affiliate marketing, and not because you can’t make money with them. The reason they were left out of this guide is that it can take months to generate your first $100 online. Some people get lucky, but they’re the exception rather than the rule. Which of our money making ideas do you think you’ll use first? Or do you plan on using a combination of them? Why not let us know with a comment below. Apply Now to Be My Student! All great points and tips about making $100 really fast although I haven’t tried 99% of them but I do tried some of them such as freelance writing, freelance designing, offering services through my blog, building niche websites etc. So I can only comment on making money online (especially from websites). Instead of creating a website and then creating services pages to offer your freelancer services, it’s always better to pick the right platforms with the customers who are already looking for your services. You can use platforms such as UpWork, Fiverr etc for finding clients when you’re starting out. Making $100 is not a big deal when you know how to sell online so make sure to improve your negotiation skills. Thanks for the rocking post.